Is it really almost 2015? My oh my, the time does fly when you are having fun! 20 years ago I was in high school, 10 years ago, I was a brand new teacher. It's hard to believe how quickly the time passes! 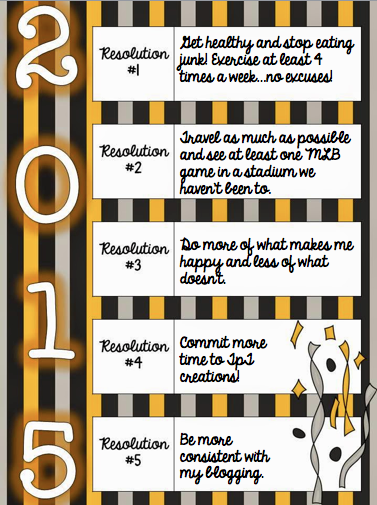 Since the New Year is upon us, I decided to link up with Jessica at Second Grade Nest for a 2015 Resolutions Linky! I definitely have some things that I would love to improve in the New Year so let's get this party started! I would like to figure out what my "next step" is. I've been in the classroom for 10 years and I love working with children, but I am ready to move beyond that and work in a different capacity. I go back and forth with that I might do next, but with the hubby retiring from the military in a few years, I feel like I need a plan sooner rather than later! I would like to give more of my time to Teachers Pay Teachers. After 10 years of teaching, I have files and files of ideas that just need a bit of improvement. I'd love to start to add more to my store and dedicate more time to my creations. I was in a great place last spring when it came to my health. I was working out 5 times a week, every morning before school. I was eating healthy and felt so good about myself. I make no excuses, but this school year has made me feel like I have zero time and as a result I have worked out less, and ate more take-out than ever before. I'm not happy with my current weight, so I MUST make time for being healthy…no excuses! If I could only visit one place in 2015, it would be OBX. We are in Virginia right now, but do not plan to stay when my hubby retires in a few years. We've been here for 4 years, but have yet to make our way to OBX so I really want to check it off of our list before we're no longer close enough to make it a day trip. There aren't many foods that haven't tried, but maybe this will be the year of the caviar, it's one food that I haven't been able to bring myself to try…yet! 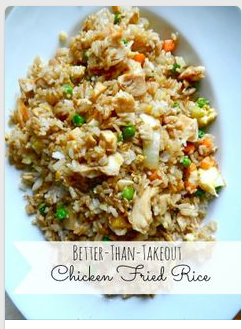 I want to learn to cook healthier meals. I can whip up lots of pastas, make my own sauce, and all sorts of crock pot meals, but 80% of them are not exactly healthy. I'd love to learn some new, good-tasting healthy recipes! Candy! I eat it ALL the time and would probably lose 5 pounds in one month if I just stayed away from the sugary goodness of candy! Read! I have tons and tons of books waiting to be read, but I get so caught up in work most of the time, that I forget to take the time to read, which is something I really, really love to do! Eliminating credit card debt! We really want to be debt free when my husband retires. I want everything paid off, although I know my school loans are never going anywhere! Most importantly, I just want to continue to be a fabulous wife to my hubby, mom to my fur babies, friend to those who have stood by me throughout the years, and teacher to my students. 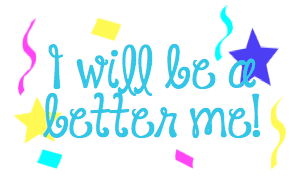 Thanks for reading all about my goals for a fabulous 2015! 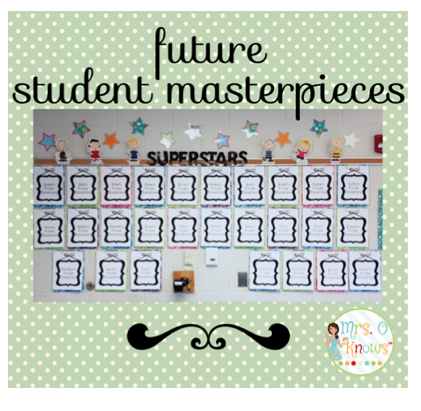 Be sure to head over to Second Grade Nest and see what other bloggers have planned for 2015! 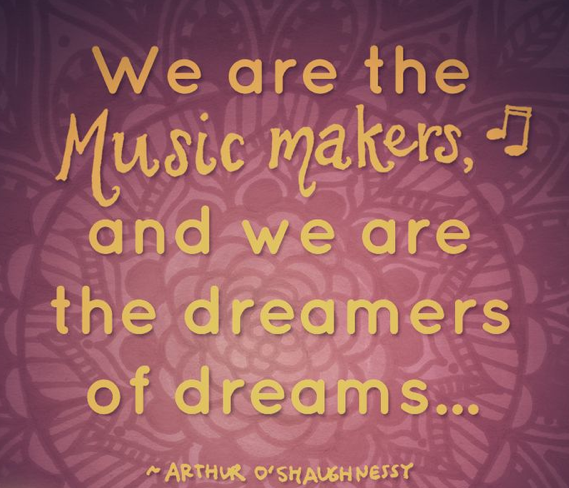 I'm linking up with A Teeny Tiny Teacher, Miss Kindergarten, and Dragonflies in First for a bit of reflection and reminiscing of the past year. This will always be my favorite quote. It's a constant reminder that I'm in charge of my own destiny and making my dreams come true. Deep, I know! My favorite dress, the Coach tour dress from ModCloth, which I now own in three colors, thanks to my hubby grabbing the houndstooth one for me for Christmas, which will probably end up being my favorite 2015 dress! It's comfy and it has pockets and it transitions quite well from season to season! 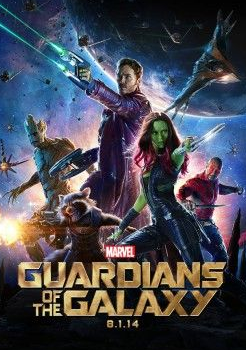 Let me say that this is not normally my kind of movie, but my hubby loves the Marvel movies and it was his turn to pick. Well, give me some awesome music I grew up with and a bunch of likable characters and I was totally sold. Two thumbs up from this girl! 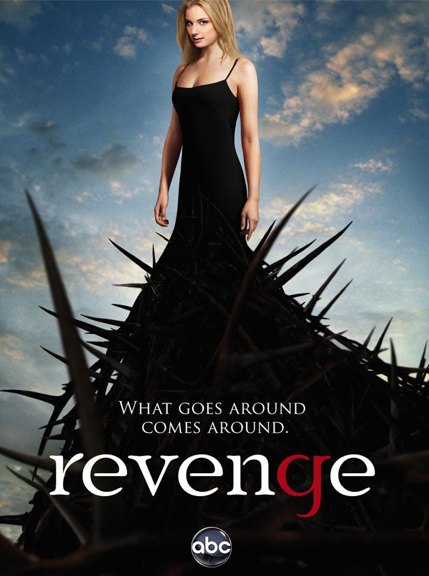 I ALMOST picked Newsroom because I really, really loved it, but it was a bit lackluster in it's finale, and Revenge has been a win for me since the very first episode. I don't know about you, but I just can't get enough of the drama in this one! 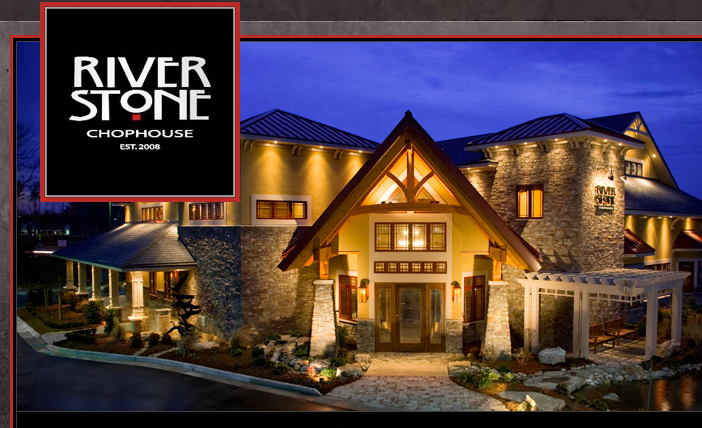 This is our favorite chophouse. Though I love all food pretty much equally (except sushi…yuck), I'm a steak and potatoes girl at heart and this place is amazing! Though this may look like a coffee commercial, or my tree side story time, this has nothing to do with beverages or stories. It's actually all about my hair! Up until this summer, I had not colored it in 7 years! As I'm in my mid-30's, it was getting dull, though I swear there wasn't any gray that I could see. I colored it with a red and brown at first and it wasn't my cup of tea <-----see what I did there? So on my most recent appointment, I decided to go darker than my normal boring brown and I LOVE it. It's a keeper! I had my hubby at home! As an Air Force wife, I know what it's like to be alone on Christmas. My husband did three deployments in our first 4 years of marriage, so anytime that he is home for the holidays, that is truly the best gift of all! 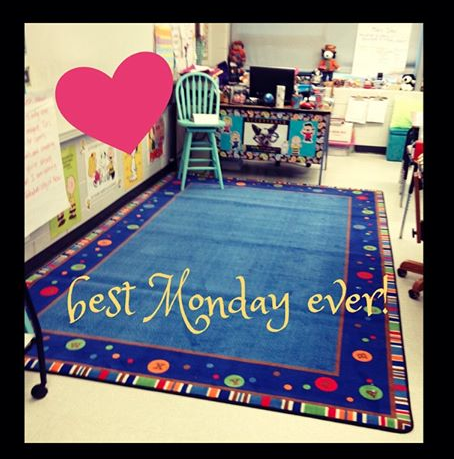 This is my favorite blog post because it is my favorite part of this year's classroom. When I went down a bulletin board after moving classrooms, I had to find a creative way to display student work. This was the end result of a lot of command strips and adorable Dollar Store clipboards. Click on the picture if you want to know more! This summer, I went to a blogger meet up and it was such fun! I learned a lot in that one afternoon and ended up coming home, committed to getting a blog redo. I also realized that I needed to hop on the Instagram train and so I joined Instagram. I noticed that Amanda from Teaching Maddeness was having a Halloween scavenger hunt. I had heard about one that was done during the summer, and now that I was an official IG user, I wanted to participate. Oh my goodness, my hubby and I had so much fun hunting around. It ended up being a blast for both of us and guess what? I won the top prize! A new, wonderful carpet from Kid Carpet. I never win anything, and so I did a lot of celebrating and so did the hubby, since he certainly helped out! And look at how fabulous the carpet looks in my room! Love, love, love, love it! The hubby and I went on a day trip to the northern neck of Virginia, checking out the wine trail along the way. This was an adorable winery called Dog and Oyster. I love how relaxed we both look in this picture! We both are so busy all the time, or stressing about one thing or another, and we needed this little trip so badly. It was perfect and that's why we both look so happy…we are! My favorite memory of this year is actually the day above for all of the reasons I just listed. I treasure those moments where we can just enjoy life without any worries lurking! This will include eating better, getting back to working out at least a few times a week, taking more time for me, and sitting back and relaxing without feeling guilty about it because I have 1,001 things on my to-do list. Life is too short to not sit back and enjoy, and so I hope to do much more of that in 2015. It's the one thing that I will always have and one of the things that I like the most about myself! Happy Christmas break! My break officially began on at 12:15 on Friday and I've already been enjoying this time off, taking naps, reading books, and spending quality time with the hubby without thinking about school. It's nice to be me again for awhile! Yesterday, I received my December SLANT Box. For those of you that haven't read other posts about SLANT Box, let me give you a quick explanation. First of all, SLANT stands for Sending Love Across the Nation to Teachers. Hosted by Jameson at Lessons With Coffee, this is a monthly exchange where you sign up, on a monthly basis, so you aren't committed to doing it more than once, just whenever you want to. Jameson matches everyone up and then she emails everyone with the person who will be sending to them and the person they will send to (which are not the same). We then get about 3 weeks to "get to know" each other so that we give each other's gift a personal touch. Each month has a specific theme to follow. 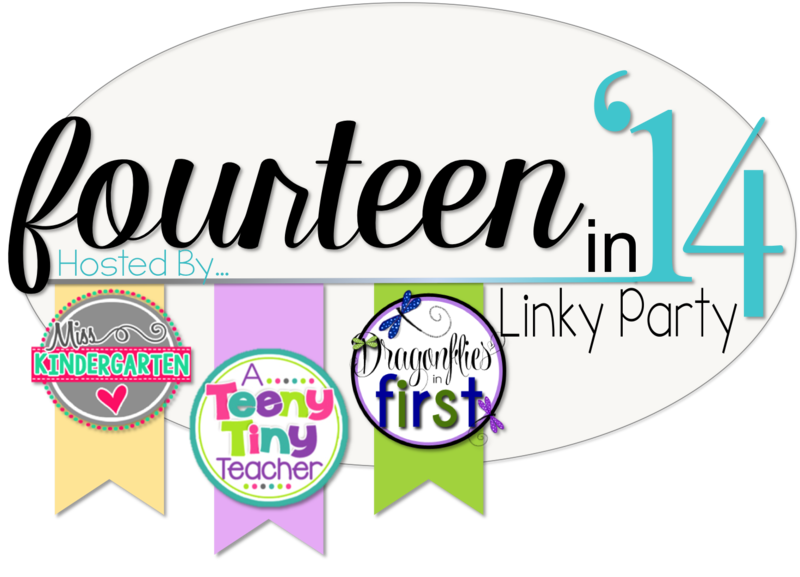 For December, our theme was 12 days of teaching so the idea was that you would get 12 of one item, 11 of another, 10 of another and so on. 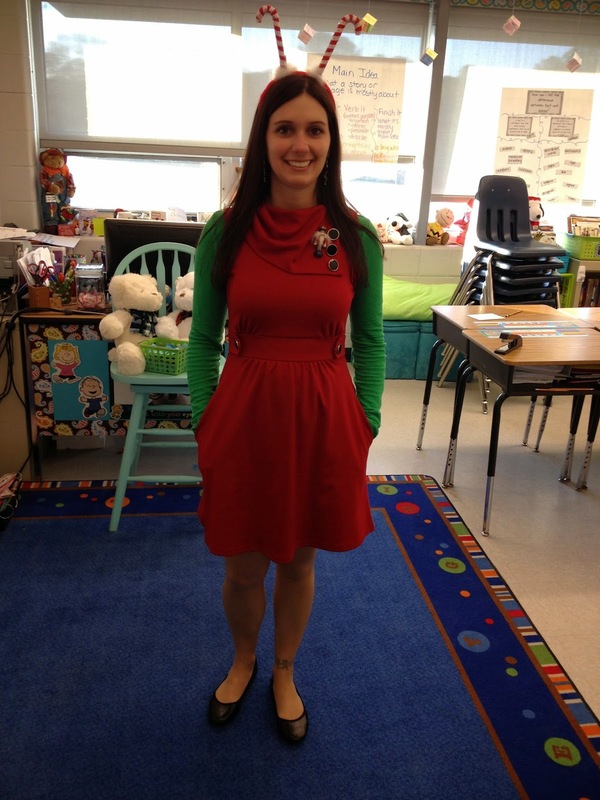 It is such a great way to make another teacher's day and hey, it's pretty awesome to have someone make your day, too! This month, I sent my SLANT Box out to the wonderful Ashley from Savvy in Second and I'm excited for her to open her box because I had such fun putting it together. I'll have to update when Ashley shares hers! Peeps, Nutcrackers, Post-it notes, Sharpies, Mr. Sketch markers, lots of goodies that included almonds, and more! I love how she snuck that cat calendar in there because I mentioned that I have two fur babies! Lauren seriously rocked this gift in every possible way! 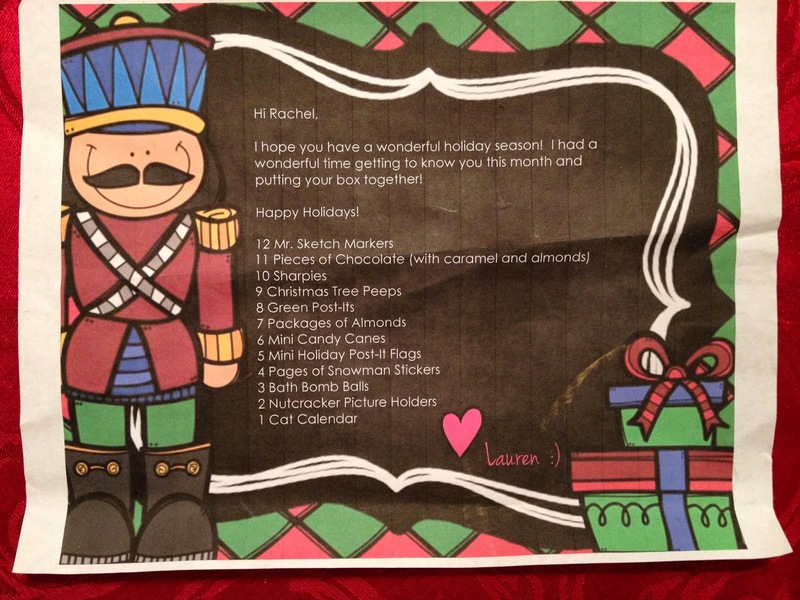 Here's the note that came with it so you can see the wonderful items that she included! I know that I can't wait to do this again! This might be the season of giving, but I love to give gifts all year long, and this is a wonderful opportunity to make another teacher's day!